So my kids are being super duper original. They are going as Frozen characters. I know, I know. However did we come up with the idea? warning: tons of pics ahead. So, Miss C is obviously…Anna! 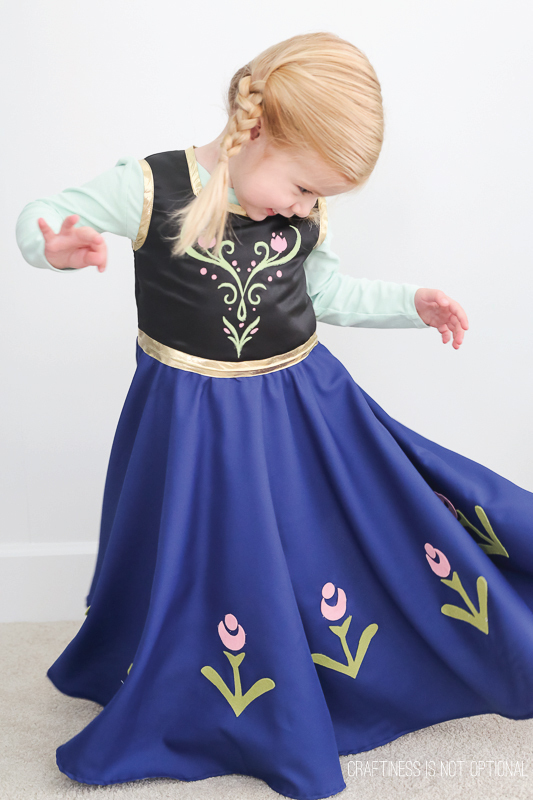 Sadie claimed Elsa way back in May when I made her dress (which I need to post still). 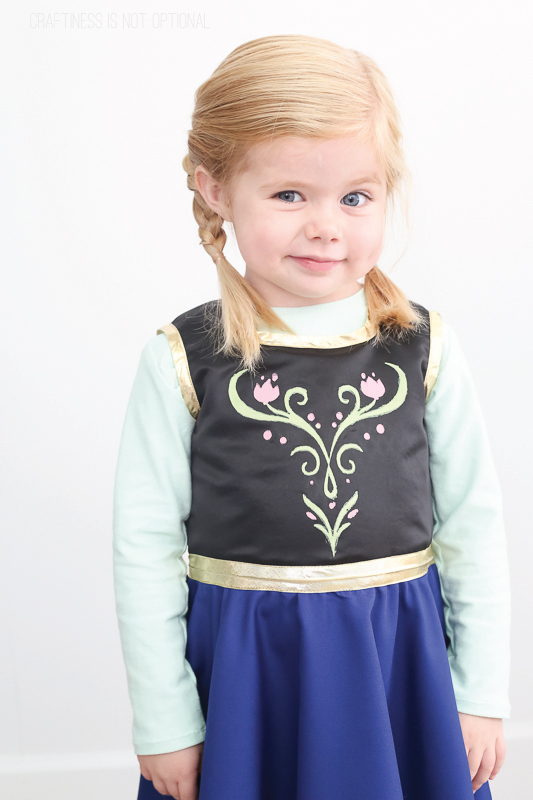 Ava is probably going to be Olaf. The fabrics are from Joann Fabrics-except the blue knit which is from Girl Charlee. So let’s talk about the dress! I had A LOT of fun making it. I used the Geranium pattern as my starting point for the bodice and altered it a little, squaring out the neckline and lengthening it too. I trimmed it in gold bias tape-and cut out the freezer paper stencil for the floral design on front with my Silhouette. Which worked great! the paint, however was tricky. The fabric was soaking up the paint like nobody’s business so I had to do like 10 coats, and therefore it wasn’t very crisp. But, it IS a costume, and with those I generally make some shortcuts. For the circle skirt, I used the Georgia Twirl skirt pattern and lengthened it too. For the little flower accents-I decided to use felt and hot glue them on (again, CSC-Costuming Short Cuts). Sometimes you just gotta glue it and be done with it. I do wish I’d placed them about 3-4 inches lower, but oh well. It zips up the back and fits quite nicely! The shirt I made with my Nessie top-straighten out the sides and hem and it’s a basic tee! Again…wow that freezer paper stenciling…not my best work. but she LOVES it. I mean LOOOOOOOVES it. So that’s why I keep making their costumes every year. Awesome – she looks so happy. Awesome! Looks great. I seriously wonder if Halloween is going to be one huge Frozen fest this year. I have an Anna and Elsa too! 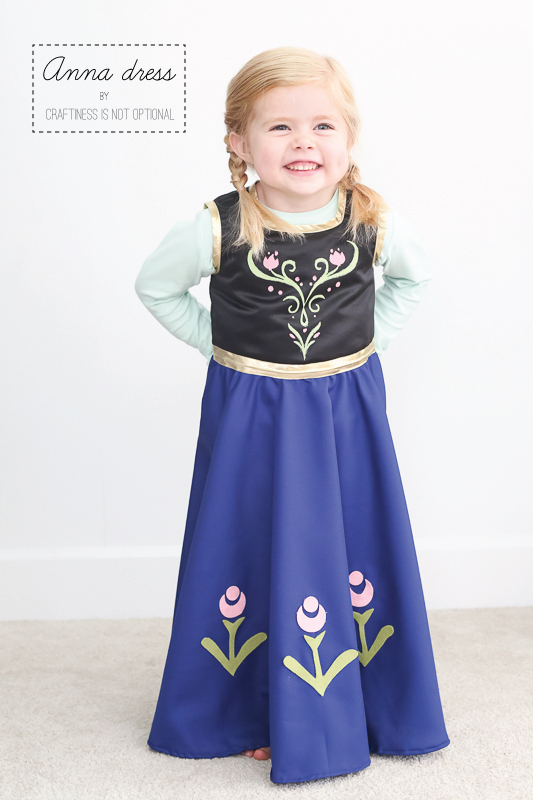 I just made an Anna dress too and took lots of shortcuts too (puffy paint, felt flowers, etc). 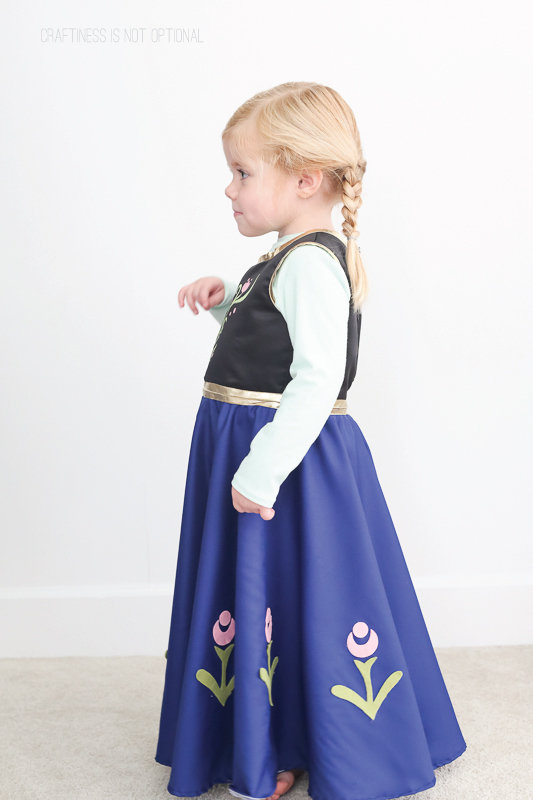 I used the same pattern to make the jumpers that the little Anna and Elsa wore as kids…My kids love having a casual dress up option as well. http://www.snugglebuguniversity.com/2014/09/the-other-anna-jumper.html. I am so impressed your kids will model for you—my 2 year old runs from the camera these days! She is a cute little girl, has a lovely smile. The dress is amazing. wow! This is so beautiful. My daughter also wants to dress as Elsa for Halloween. I’m afraid she’ll get lost on the evening in the crowd of little girls dressed as Elsa *G*. Im making costumes for Christmas….Sadly we dont have Halloween here in australia!! It is lovely, I can see why she loves it! 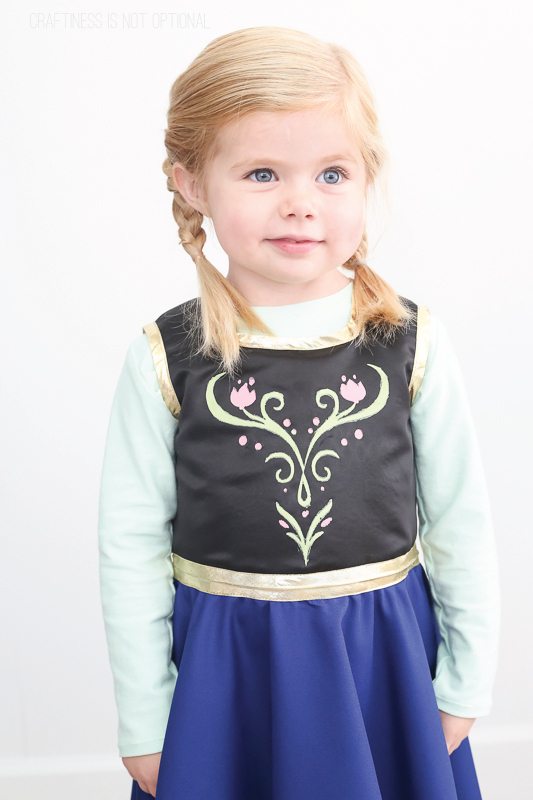 I am also considering some Frozen costumes and am very much looking forward to your Olaf’s! She looks absolutely delighted! the costume is great and the stencil looks Ok from here. 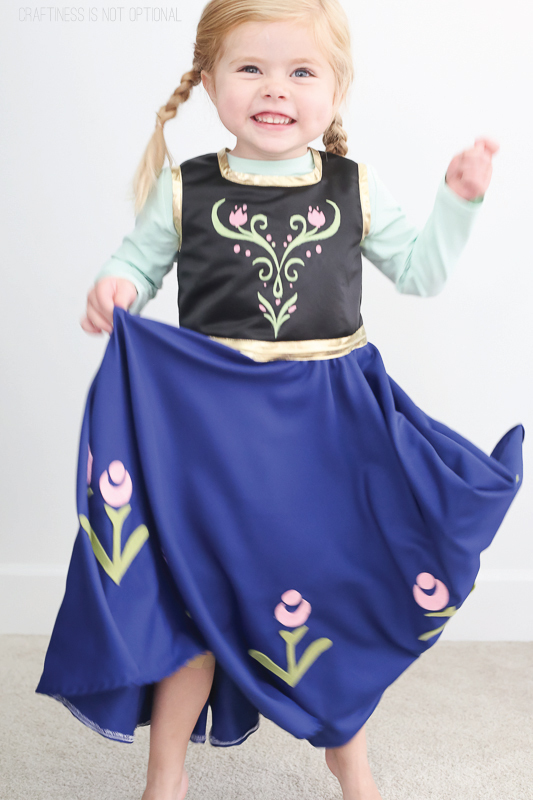 My daughter has borrowed a store bought Anna costume from a friend and it’s not nearly as nice as this (plus she keeps tripping over the darn thing!) Good on you! She’s a doll and you did an awesome job! It looks fantastic. It’s perfect! I think the stenciling looks great! My daughter sat in my lap and screamed “It’s ANNA!” haha. Oh my goodness this is just super duper adorable!!! The dress and the pictures! perfect! Gosh, I sew love following your blog. 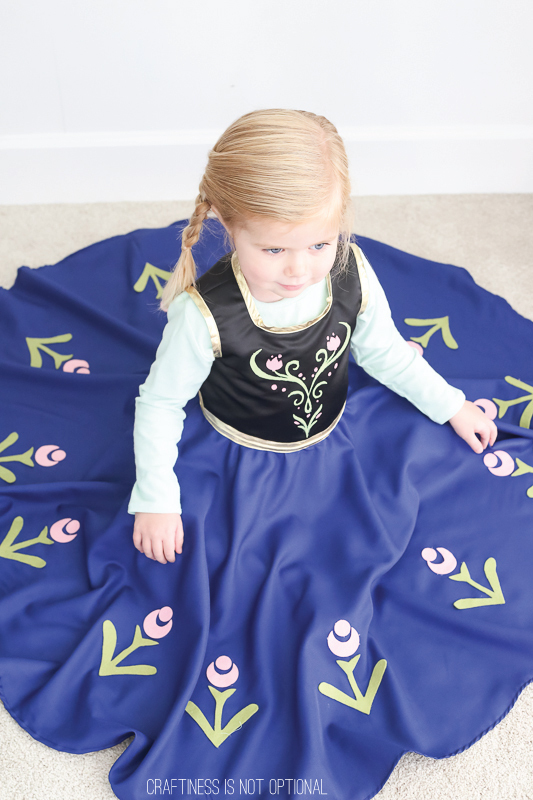 Not only are you one awesome sewist, I delight in seeing the pleasure your sewing brings to your beautiful girls. Please keep sharing. It’s beautiful! You did an excellent job. 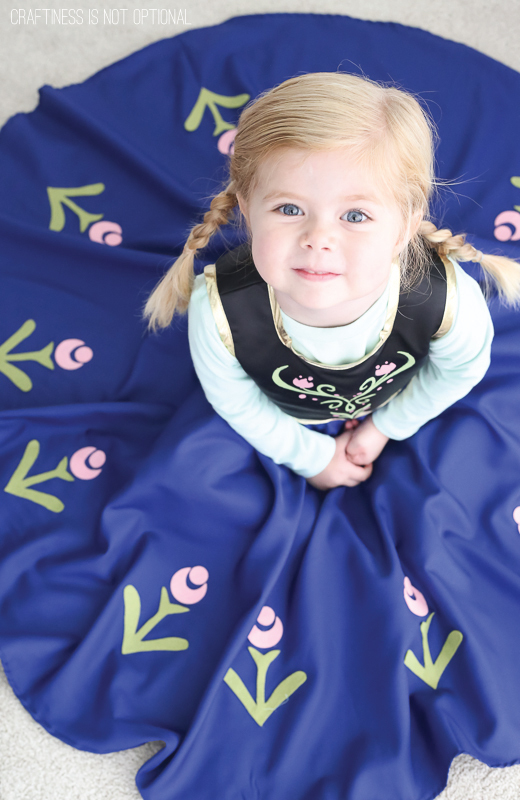 Awww… I have a little Princess Anna this year too! The skirt with felt flowers is so adorable! awesome! that’s why I glued it-it would be practically unnoticeable! adorable!!! Love the flower design!!! pinned!! OMG the picture with the raised eyebrow is adorable such character. Great job! I am a sewer so it looks grest even the stenciling. oh man you can tell she loves it soooo much!!! adorable. 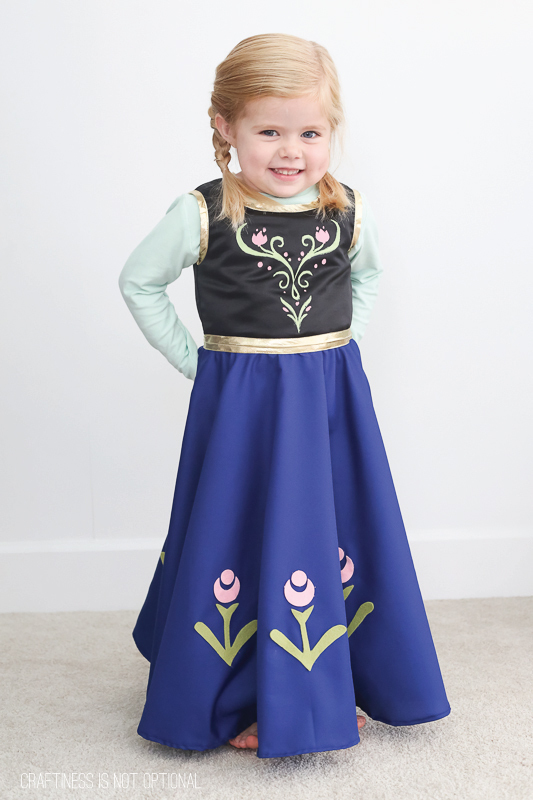 my sister’s girls are going as elsa and anna too, and of course Em is going as Elsa…still need to sew that dress up, though. 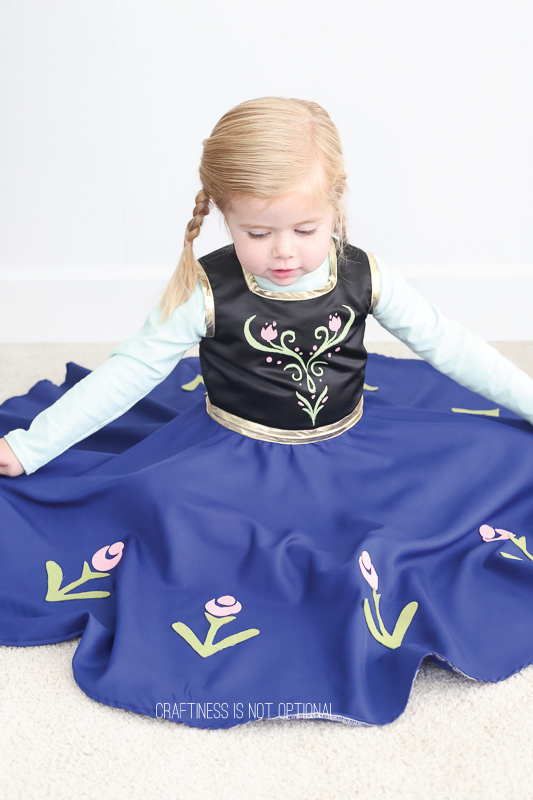 Aaaaand blog the birthday party that Sadie attended in her elsa dress! Man. Life. MY super-original daughter is going as…. wait for it… ELSA. 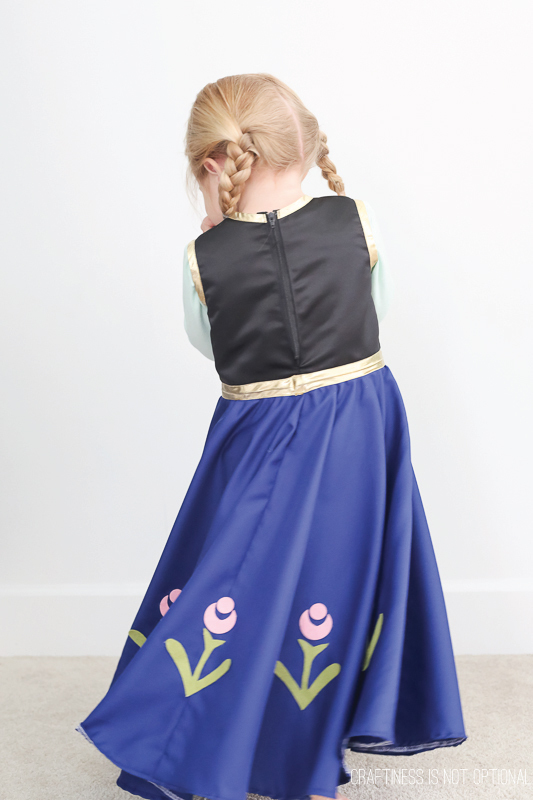 But not only that — she HAD to have the Elsa costume from Target! She conned my husband into buying it with her ferocious cuteness. Wouldn’t let me make it! Little does she know, her gymnastics class will be having a dress up party that they cannot wear dresses to, so I still get to make something. The little rascal.